A man who was seen in possession of a three inch knife during a ‘gang related’ incident has been given a suspended jail term. Patrick Joseph Doran, of Carr Street, Preston, pleaded guilty to possessing a knife in Lancaster Railway Station on Westbourne Road, during an incident on April 25. He also admits a charge of possessing cannabis. 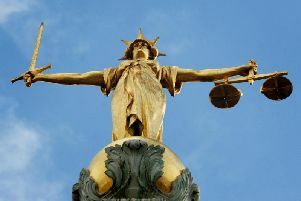 The bench ruled the offence merited custody because it was gang-related and was committed in a public place and committed whilst subject to a conditional discharge. The court ordered the knife and drugs to be destroyed. He was fined £50 over breaching his court order and must pay a £115 victim surcharge and £85 prosecution costs. A man assaulted a woman and trashed her possessions, a court has heard. Joseph Kelly Swarbrick, of Bardsea Place, Ingol, Preston, destroyed an i-Phone, a French bulldog ornament, an ornamental clock, a display cabinet, and Turkish ornamental plates. During an appearance before Preston Magistrates’ Court, the 45-year-old defendant admitted assaulting his victim during the same incident on August 6 this year. He was given a rehabilitation activity requirement and must pay a £85 victim surcharge, the court ruled. The bench also made a restraining order to protect his victim. Hazel Simone Stevens, 50, of Marlborough Road, Heysham, was discharged conditionally for 12 months after admitting stealing groceries and alcohol and must pay a £20 surcharge and £85 costs. Cara Prevett, 29, of Railway Road, Brinscall, Chorley, was banned from driving for six months after being found guilty of failing to give driver information, and must pay a £660 fine, £66 surcharge and £85 costs. Lisa Marie Robinson, 32, of Pine Court, Leyland, was banned from driving for six months after being found guilty of failing to give driver information, and must pay a £660 fine, £66 surcharge and £85 costs. Krzysztof Hankus, 38, of Braddon Street, Preston, admits driving without insurance and must pay a £180 fine, £30 surcharge and £85 costs. Craig Robert Clarke, 32, of Northgate, Chorley, was found guilty of breaching a restraining order and must pay a £80 fine, £30 surcharge and £85 costs. Krystyn Porter Jamicki, 36, of Park Avenue, Preston, admits assaulting a woman and criminal damage, and must pay a £80 fine, £30 surcharge and £85 costs. Verity Southworth, 39, of Clartence Street, Leyland, must have alcohol treatment after admitting assaulting a man, and must pay a £80 fine, £55 compensation and £85 costs. Paul Ashcroft, 21, of Fylde Street, Kirkham, was found guilty of failing to pay his rail fare and must pay a £440 fine, £44 surcharge and £150 costs, as well as his £10.60 fare. Avril Abigail Annan-Anayetteman, 25, of Trinity Place, Preston, was found guilty of failing to pay her rail fare and must pay a £440 fine, £44 surcharge and £150 costs, as well as her £8.50 fare.